My son has been obsessed with magnets of late. The invisible forces that draw objects together and can keep things from falling to the floor fascinate him. He'll test objects to see which are most likely to interact and he'll explore the boundaries of the attractive forces. One of his favorite toys (of the moment) is a Ball of Whacks, a puzzle comprised of small magnet pieces that fit in a specific pattern of with attractive forces to form a ball. The trick is to find the right sequence of attractive forces that don't align with the repulsive forces of the nearby pieces. In some ways, there is an analogy to NISO and the library marketplace in this toy. Competitive and market forces draw some organizations together to serve the common good, but these need to be put together in a subtle way for the whole not to be pushed apart by those forces that repel adjacent or related industry players. Collectively, we form a cohesive whole, but we need to find the right pattern or mix of partners to tie everyone together. Sometimes, as was the case Tuesday with the two significant merger announcements (3M and Bibliotheca and Ex Libris and ProQuest) in our community, there are other forces that draw parties together. These forces are often (although not always) stronger than the things that keep organizations apart. Obviously economics is a very attractive force, and there are many benefits of combined organizations. Just Monday, during the NISO forum on the Future of Library Resource Discovery, during a panel of discovery service providers, the question was asked if there were enough resources in the community to support continued development of these systems and whether there would still be four providers in a few years. Before the end of the meeting, there was an answer to the latter question. What will be interesting to see is if there will be related after-effects of this realignment. Like earthquake aftershocks, I expect there will be reverberations. Some may be large, while others might be smaller or even go un-noticed. Regardless, the community is expanding, while it contracts in other ways. The expectations of writers, readers, libraries and patrons are all shifting. The notion of what it is to be a publisher is expanding, and new entrants with innovative services and products join our community all the time. NISO's role in the community remains stable, perhaps even more important in light of these changes. There will always be a need to coordinate among competitors to build on interoperability. Suppliers and customers need neutral forums to discuss issues and advance common solutions. We still need bridges among providers of content, services and libraries, which is one of NISO's core services to the community. NISO can help build those bridges and this is where our greatest value resides. NISO can help find ways to bring those pieces together that have common interests and goals and thereby fit them into a cohesive whole. Just like my son's puzzle, but on a worldwide scale. After Oyster, What's Next for E-book Subscriptions"
When young, we look to the sky and see shapes in clouds. We watch as the cloud reshapes into something else. Like actual clouds, the world of digital cloud-based tools seems to also be ever changing as this new technology is developed. For librarians, trend of moving ILS systems to the cloud has exciting possibilities but enthusiasm is tempered by uncertainty. Cloud-based web services are a somewhat new tool, and as such, options are limited. These services are being continuously upgraded, and librarians need to have a voice in the development of these tools to be sure their needs are met. Libraries have needs that are complex and evolving and available ILS systems are presently limited in their abilities. Minimally, an ILS system will track what the library owns, its patrons, what they have borrowed, and other general library services. These minimal functions do not take into account the need for integration with the wider array of online services libraries offer nor integration into services of the libraries' academic institution. During this webinar on Wednesday, October 14 from 1:00 p.m. - 2:30 p.m. (EDT), presenters will discuss what capabilities libraries need versus the capabilities currently offered in commercial ILS systems, and possible short-term solutions as well as helping ILS cloud services to understand better what future versions of their products should include. For more information about the webinar and to register, please visit the event page. The demands for awareness of and responsiveness to the academic user experience (UX) are increasingly important for all players in the scholarly communications industry. What began as a software development methodology has proven to be a critical function in our ability to deliver high-quality scholarly resources to a global readership. During this virtual conference on Wednesday, October 28 from 11:00 a.m. - 5:00 p.m. (EDT), we will feature a range of perspectives on how publishers, libraries and technology suppliers achieve an understanding of reader needs and perspectives, in order to drive iterative improvements in the way users interact with the content we host, publish, and license. For more information about the virtual conference and to register, please visit the event page. NISO and the International Council on Scientific and Technical Information (ICSTI) are pleased to announce a new webinar partnership beginning this fall. The first program is focuses on creating an ecosystem of Open Science. The progressive acceptance and implementation of open access has paved the way for new possibilities in the creation, authentication, organization, manipulation and preservation of data and information, and its broader access, sharing and communication. Momentum towards the achievement of the vision of the International Council for Science of a 'world where excellence in science is reality' is gathering pace. During this webinar on Tuesday, November 10 from 10:00 a.m. - 11:30 a.m. (EST), the speakers will discuss their standpoints as a practicing scientist and a policy maker and research funder, respectively. Current thinking on the behavioral and technical issues to address, and the barriers to confront, in order to convert the vision of open science in practice will be addressed. For more information about this partner webinar and to register, please visit the event page. Join members of the KBART (Knowledge Bases and Related Tools) Standing Committee at the Charleston Library Conference as they guide you through the ins and outs of the KBART Phase II Recommended Practice. Through classroom instruction and hands-on experience, the workshop will provide in-depth coverage of all KBART data elements, with special focus on many of the most frequently asked questions about the recommended practice. The session will also outline the steps in the KBART adoption process and highlight the benefits of endorsement. Participants will also gain insight into how the provision of standardized metadata can increase exposure of their electronic content, ensure smoother interoperability with knowledge base and link resolver vendors, and ultimately improve end user access. This Charleston Library Preconference will be held Wednesday, November 4 from 1:00 - 5:00 p.m. EDT. Registration for the preconference is an additional $110.00 above the conference registration fee. More information about attending the Charleston Conference is available here and the registration form is here. With the digital revolution, the ability to search vast amounts of information for specific bits of data has increased exponentially with more and more previously hard-copy only books and information being digitized and made available online. There are many organizations working to digitize content for the benefit of researchers and others. For example, HathiTrust is a partnership of organizations that offers digitized information from libraries all over the world. Data mining partnerships between university libraries and vendors will hope to bring millions of books and periodicals to the fingertips of researchers. During this webinar on Wednesday, November 18 from 1:00 p.m. - 2:30 p.m. (EST) presenters will talk about the benefits and challenges to text mining and its impact on the library and information community. 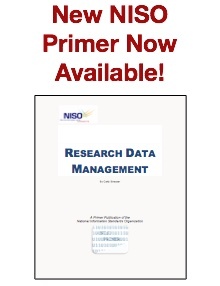 In June 2013, NISO began work building consensus around the need for standards to support new forms of assessment (often called altmetrics) with generous support from the Alfred P. Sloan Foundation. This two-phase initiative aimed to explore, identify, and advance standards and/or best practices related to a new suite of potential metrics in the community. Earlier this year, the NISO Altmetrics Initiative successfully moved to Phase Two with the formation of three working groups to define those standards and best practices. Working Group B, lead by Kristi Holmes, PhD, Director, Galter Health Sciences Library at Northwestern University, and Mike Taylor, Senior Product Manager, Informetrics at Elsevier, are focused on non-traditional output types & persistent Identifiers within the alternative metrics landscape. During this free webinar on Monday, November 16 from 11:00 a.m. - 1:00 p.m. (EST), speakers will highlight case studies and examples of the work being done in this area. For more information and to complete a quick survey to receive the event login, please visit the event page. Presentation slides from September 23 virtual conference: Scholarly Communication Models: Evolution or Revolution? A recent enhancement to the Thema online browser means that you can now search directly for a particular code (such as 'GLK'), as well as the previous search for words within the subject heading text. Cross-references between headings (eg See also: (e.g. see also: WCP Antiques and Collectables) are now clickable, which makes browsing the hierarchy of categories a smoother experience. And a more fully case-insensitive search has been put in place, so a search for 'Galápagos' and 'GALÁPAGOS' in Spanish or French, for example, are now the same - this should help those searching in Latin-script languages other than English. Previously, searches including accented characters were not case-insentitive. Another planned feature is the option to allow country variants of subject heading text translations - so both French and French Canadian translations could co-exist. Members of the OASIS Darwin Information Typing Architecture (DITA) TC have recently approved a Special Majority Ballot to advance Darwin Information Typing Architecture (DITA) Version 1.3 as a Candidate OASIS Standard (COS). The COS now enters a 60-day public review period in preparation for a member ballot to consider its approval as an OASIS Standard. The Darwin Information Typing Architecture (DITA) 1.3 specification defines a set of document types for authoring and organizing topic-oriented information and a set of mechanisms for combining, extending, and constraining document types. DITA is specializable, which allows for the introduction of specific semantics for specific purposes without increasing the size of other XML grammar files, and which allows the inheritance of shared design and behavior and interchangeability with unspecialized content. The latest edition of ISO 9001, ISO's flagship quality management systems standard, has been published. This concludes over three years of revision work by experts from nearly 95 participating and observing countries to bring the standard up to date with modern needs. The 2015 edition features important changes, which Nigel Croft, Chair of the ISO subcommittee that developed and revised the standard, refers to as an "evolutionary rather than a revolutionary" process. 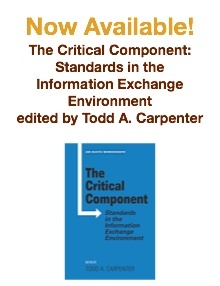 More details about the changes to the standards are outlined on the ISO website. Certification bodies will have up to three years to migrate certificates to the new version. ISO/TR 19300:2015 is a non-normative technical report that provides guidelines to enable print industry stakeholders to use ISO/TC 130 and related standards in print media production workflows. The use of these standards is intended to enhance production quality, business performance, profitability, and sustainability. Summary of interviews with Martha Sedgwick (executive director of product management at SAGE Publications and Peter Ciuffetti (VP of product development at Alexander Street Press) regarding publishers' concerns in fulfilling changing user needs in today's information ecosystem. Discusses the management of new product offerings, discoverability (including search engine optimisation, library discovery, and building links to related content) and user experience. "There are no simple, one-size-fits-all solutions, but the increasingly competitive space is driving innovation, and those publishers who innovate successfully in the development of new platforms will continue to underline the importance of publishers to the scholarly information ecosystem." 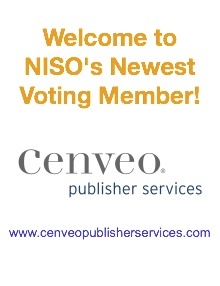 NISO Note: SAGE Publications is a NISO Voting Member. "The LOCKSS Program develops and supports libraries using open source peer-to-peer digital preservation software. Although initial development and deployment was funded by grants including from NSF and the Mellon Foundation, grant funding is not a sustainable basis for long-term preservation. The LOCKSS Program runs the "Red Hat" model of free, open source software and paid support. From 2007 through 2012 the program was in the black with no grant funds at all. The demands of the "Red Hat" model make it hard to devote development resources to enhancements that don't address immediate user demands but are targeted at longer-term issues. After discussing this issue with the Mellon Foundation, the LOCKSS Program was awarded a grant to cover a specific set of infrastructure enhancements. It made significant functional and performance improvements to the LOCKSS software in the areas of ingest, preservation and dissemination. The LOCKSS Program's experience shows that the "Red Hat" model is a viable basis for long-term digital preservation, but that it may need to be supplemented by occasional small grants targeted at longer-term issues." By Justin Brown, Scott Hollier. First Monday, September 2015.